Home • News • Five Years After Deadly San Bruno Explosion: Are We Safer? 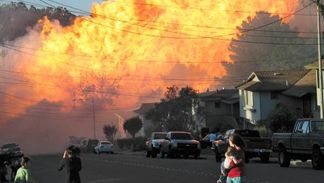 Five Years After Deadly San Bruno Explosion: Are We Safer? Sept. 9, 2010: a cool, breezy Thursday evening, not much different from most other weekday nights in San Bruno’s Crestmoor neighborhood. Residents were arriving home, making dinner, hanging out with their families. Then, at the corner of Glenview Drive and Earl Avenue, came a blast so powerful that one resident said it sucked all the air from her living room. The fireball that soared into the sky at 6:11 p.m. instantly transformed the neighborhood into a scene of chaos, with people dashing from their homes, first to see what happened, then to try to escape with their lives. “When you’re in a dream and you try to run as fast as you can but feel like you’re getting nowhere, like you’re in quicksand — that’s how it felt,” Earl Avenue resident Tammy Zapata said later. In the 50 minutes before the explosion, technicians at the PG&E natural gas terminal in Milpitas and workers monitoring the company’s pipeline network were dealing with a crisis. An electrical failure at the terminal, which helps regulate the network, had triggered an uncommanded increase in pressure to Line 132, a 30-inch pipeline carrying natural gas from Milpitas to the Peninsula and up to San Francisco. Alarms started to sound, warning of dangerously high pressure. The electrical problem had also knocked out sensors used to monitor the network. As the pressure surge continued for 10, 20, 30, then 40 minutes, staff in Milpitas and in two monitoring centers struggled to understand just how high the pressure inside the pipeline really was and how to bring it under control. Continue reading on kqed.org » You can also listen to the 6-minute, 13-second radio report and find related content on the website.